Hunger can be a tough beast to tame. To effectively lose or maintain weight, restricting your daily calorie intake can often leave you feeling deprived. Add in workouts, which only increase your appetite, and the struggle becomes even real-er. If you’re here to find out which low-calorie foods will fill you up, you’ve clicked wisely. Below are some smart choices for healthy, low-calorie filling foods. But first, let’s discuss how food fills you up in the first place. The satiety index is a scale that measures how full people feel after eating certain foods, with white bread being the baseline. There’s moderate correlation between the placement of foods on the satiety index and the following factors. Also called roughage or bulk, fiber is a form of carbohydrate found in plant foods that the body doesn’t digest. This serves a two-fold purpose: it promotes regularity by providing more substance to your poops, and it keeps you feeling full longer because it’s slow to move through your digestive tract. Pectin in particular is a form of fiber that takes longer than other nutrients to move through your digestive system by forming a gel within your intestines. Pectin studies have resulted in weight loss with no loss of lean mass (muscle). This vital building block of muscle and other tissue has been proven the most filling of the macronutrients. Eating protein not only helps you feel full, it can also help you to lose weight without losing muscle. Andrea N. Giancoli, MPH, RD, manager of nutrition and culinary development for Openfit recommends including protein with all meals and snacks. Foods that contain a lot of air and/or water are filling because they occupy more space without adding more calories. While high-volume foods won’t necessarily keep you full for as long as high-fiber foods, they can be a quick fix when your stomach feels empty. All of the following foods have at least one element to help keep you full. Mix and match them as needed so you feel satiated, without worrying that you’re using up all of your daily calories on snacks! Low in calories and high in fiber, whether eaten as overnight oats, baked oatmeal, or the simple stove top version, the beta-glucan fiber in oats will help you feel full. Plus, oats soak up water, so eating them with additional liquid will give them even more volume to fill you up. High in fiber as well as water, vegetables such as broccoli, cauliflower, and Brussels sprouts are great choices for low-calorie snacks that will fill you up. Fitness nutritionist Rachel Bocchino recommends broccoli as a nutrient rich, hydrating choice. Try dipping it in a low- or non-fat Greek yogurt-based dip instead of one made with sour cream for the filling effect of protein without the fat. Beating out even steak and eggs, fish leads all protein-rich foods on the satiety list. 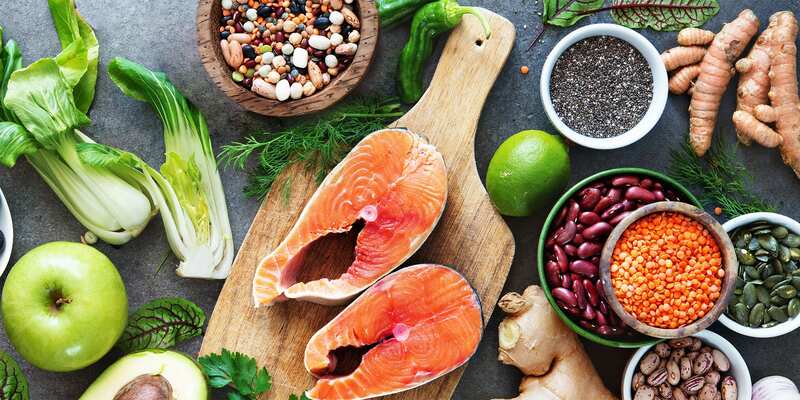 Fish also packs omega-3 fatty acids, which studies suggest may help suppress appetite and even promote changes in metabolism that favor fat burning. High in volume, popcorn promotes satiety by simply taking up so much room in your stomach. Additionally, it’s a high-fiber food. Giancoli suggests air popping; if you don’t have an air popper, she recommends using the smallest amount of oil possible in a nonstick pot, and opting for an oil spray instead of butter as a topping. It’s no surprise to find this cool-again food on the list; we devoted an entire article to how great cottage cheese is, and the many ways you can eat it. In addition to a whopping 24 grams of protein per cup, cultured cottage cheese contains probiotics (check the ingredients to make sure). Those healthy gut bacteria have been shown to reduce food cravings, promote healthy body composition, increase fullness, and even improve mood. Soup’s appearance here may seem counter-intuitive given that it’s a liquid. But blended soups take extra time to move through your digestive system, resulting in fullness for longer. You can compound the effect by blending fiber-rich cruciferous vegetables with bone broth, which contains gelatin to help you feel full. These are among only a handful of foods that contain pectin, which has been shown to help with satiety. In fact, their multiple forms of fiber make these little fruits a big “yes” for a filling snack. Try baking apples with cinnamon on top for an apple pie vibe. Topping the satiety index, potatoes are a healthy food that can help you feel full for hours. This is contingent on a couple factors, though: they should be steamed or baked — not fried — and, Giancoli notes, you should be careful about what you put on them. Top with sour cream and butter, and you no longer have a low-calorie snack or side; try Greek yogurt or cottage cheese instead. Known more commonly as beans, the legume and pulse categories of food also include peas and lentils. They’re good filling foods because they’re high in both protein and fiber. Snack on fresh peas, make a “cowboy caviar” spread with lentils, or try your hands at a bean dip. They’re called “miracle” noodles with good reason: made of only konjac fiber, shirataki noodles contain no calories at all per serving. They don’t drive you to overeat in compensation, either; a 2017 study showed no difference in subsequent appetite when compared to their calorie-filled counterparts. Gelatin, a form of collagen protein, is not only essential as a gelling agent in foods, it’s useful for weight management. Gelatin solidifies liquids, meaning you can turn a low-calorie, water-based beverage or broth into a filling snack. Surprised to see avocados and nuts absent from this list? Avocado is a filling food, but it’s not a low-calorie one. At more than 20 grams of fat per fruit, you’re liable to throw off your macros before you feel full. As for nuts, they’re nutrient rich, but also high in fat; one single ounce serving of almonds, an otherwise good choice for satiety, contains nearly 14 grams of fat. What’s the Most Filling Food? While the satiety index suggests the most satisfying food is potatoes, there’s clearly no shortage of low-calorie filling foods. Focus on fiber, protein, and volume in your diet, and you’ll slay the hangry dragon within!